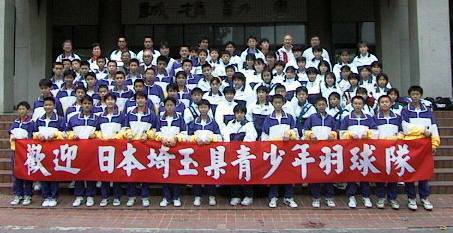 Our Camp in Taipei had hold for six days, Dec 25 to 30,1998. Participant members are Mr.Ikari,President of Saitama-Ken Badminton Association, and 39 persons including 33 Elementary & Junior high school students. Our camp's purpose was to develop our badminton skill and to make up friendship between both people. About Practice and Arranging game, We had played at three senior-junior high school above during whole camp with the warmest treatment by Taipei Badminton Association members. About Game, It was very hard for our students to touch hit shuttle by Taipei students, who were cheerful and relaxed, hit them very correctly. We also had the kindest by Taipei students'parents at break time and we were moved perfectly. Of course, both kids were friendly each other in short time and they took many pictures and played something without language barrier. I'm sure that those things will have our earth make up one!! We got a great result for our camp and returned to Japan with no trouble. Finally, We have to say thanks a lot to Mr.Wu and Mr.Lian in Taipei Badminton Association for huge support.